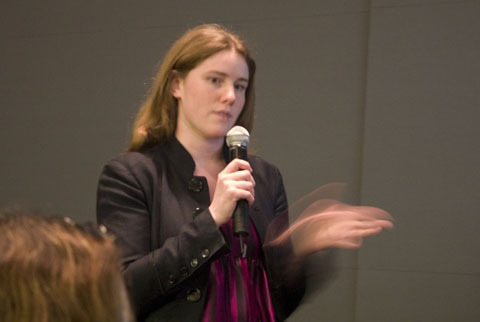 Published at March 9, 2007	in . Closed Tags: No Tags. Last night I went up to the Stockton Street Apple Store presentation theatre for the SF360 fifty year retrospective leading to the 50th San Francisco International Film Festival. 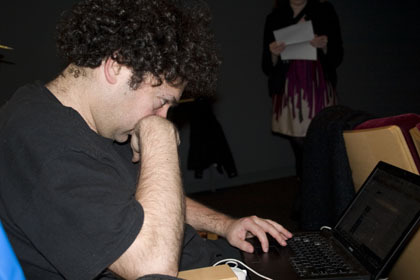 Fellow blogger, Steve Rhodes of TigerBeat, was there also taking photos and blogging the event. 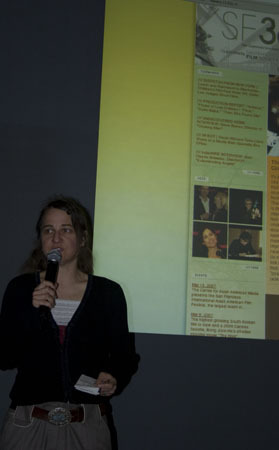 First, Susan Gerhard, the editor and bureau chief of SF360, spoke about the information available on the site. 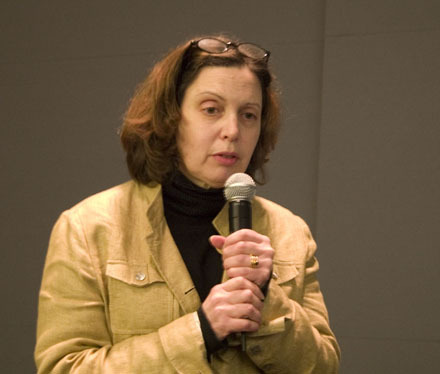 Then photographer Pamela Gentile regaled us with how she began as photographer for the festival in 1985, the stories behind her classic images of movie stars, directors and other luminaries at the festival. 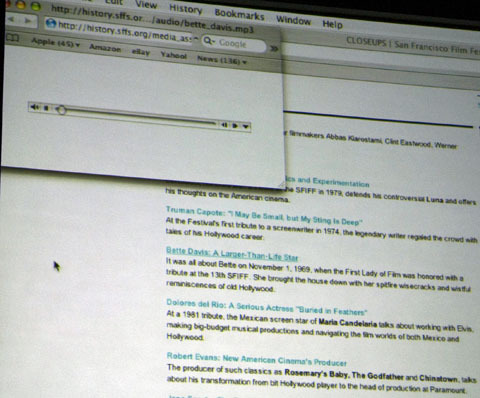 Followed by Miguel Pendas, San Francisco Film Society historian, demonstrating how to look up information on the site historical section. 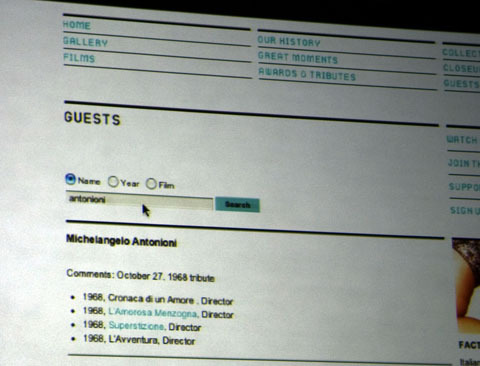 Miguel’s demonstrated a search for festival guests starting with Antonioni, leading to others. 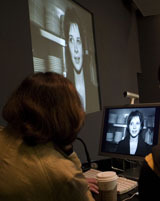 Finally, archivist Jennifer Preissel showed the treasure of audio and video media being made available in the historical area. 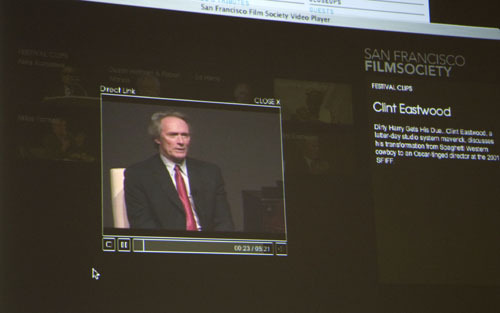 Jennifer showed video of the 2001 Clint Eastwood interview (image at top) and audio from Bette Davis reminiscing during her tribute at the 13th SFIFF. 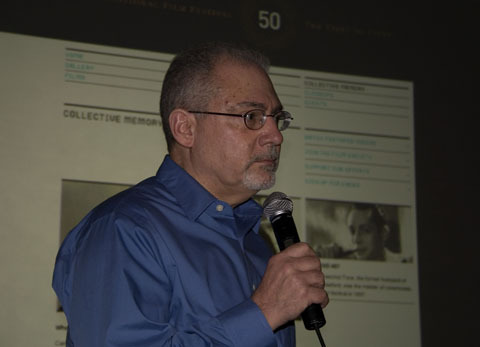 The film festival web sites will be filling in with more material leading up to the opening night on April 26th. Expect more audio and video to go online. So have a look at whose shown up in the past and going to be at the 50th.